Start small – when you first bring your kitten home, prepare a small room for him or her. This small space should be a safe and warm area where your kitten can feel comfortable and build confidence about your home. You can gradually open up more rooms to her once he or she’s ready and knows what’s expected. Cats don’t like their litter box too close to their food, so separate these items within your space. Come visit – you guessed it! One of the very first things (if not the first) you should do is to come see us for a new kitten veterinary exam. This is important for your kitten – to verify age, examine him or her for birth defects and disease, and to screen for parasites. But it’s also a time for you to ask questions about things like litter box training, developmental needs, and socializing your kitten. This visit lets us start your kitten off on a great path with her preventive care and vaccinations as well. Shop for quality food – One of the best things you can do for your new kitten (and all your pets, really!) is to feed them the best quality food you can afford. Just as it does for people, nutrition makes a big difference to their health over the course of a lifetime. It can even contribute to longevity! Kittens need a specially-formulated kitten food in order to get all the nutrition they need. Ask us for recommendations, and we’d be happy to help. Get on schedule – To keep up with your kitten’s growing nutritional needs, you’ll need to establish a feeding routine. Kittens need to be fed up to 3 times a day for the first 3 -6 months, and then you can scale back to twice a day. Keep feeding kitten food for the first year. Socialize your kitten – Socializing your kitten can give her a lifetime of good behavior and happiness. Kittens (and cats) need daily interaction with you and your family to grow and maintain a strong emotional bond. If you have children, teach them how to handle your kitten gently and how to give her a break when he or she needs it. Making sure your kitten is comfortable with having his or her body handled will also make grooming and veterinary care easier on the animal (and you) in the future. Once we have cleared your kitten of any parasites and she’s protected from disease by vaccination, it’s ok to have her meet other pets in your household. Start slowly and watch carefully to make sure everyone has a positive experience. We hope these kitten care tips have given you a primer to get started with caring for your new kitten. 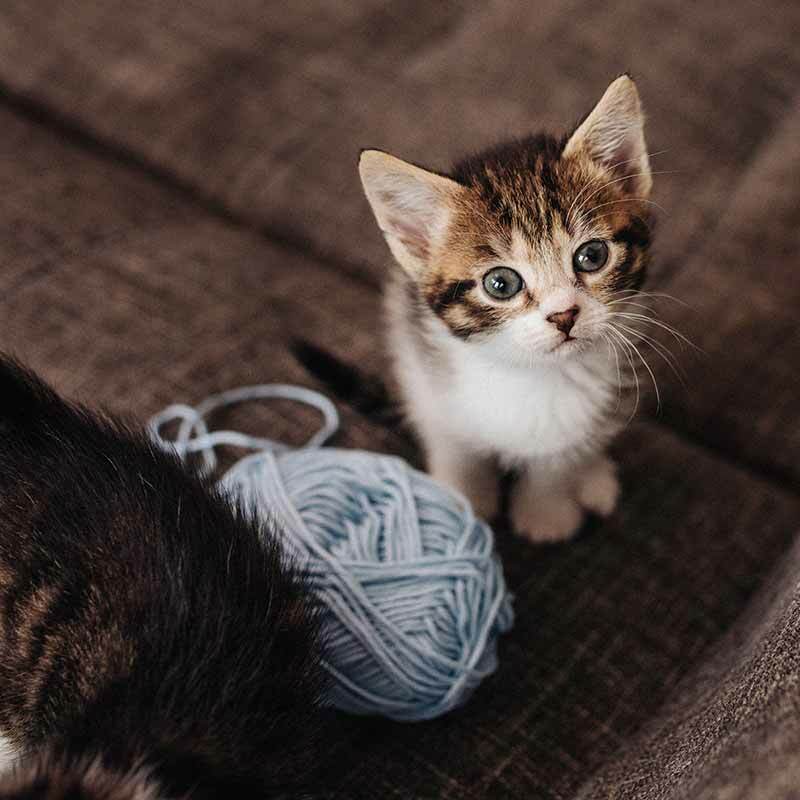 This fun and exciting time is also a big responsibility, but with a little time, knowledge and effort, you can look forward to a lifetime of good health and happiness for your new kitten. Give us a call to set up your first appointment today.